With so much excitement yesterday morning, we missed this gem recently announced for Google Search users. Now appearing in search results when you place an inquiry for a business, you will be shown Popular Times for said business, hopefully leading you to not wasting time in long lines or crowds. After taking it for a spin on a few places by my home (Best Buy, Target, and McDonald’s), it seems to work just fine, displaying to me which times these businesses are most busy. 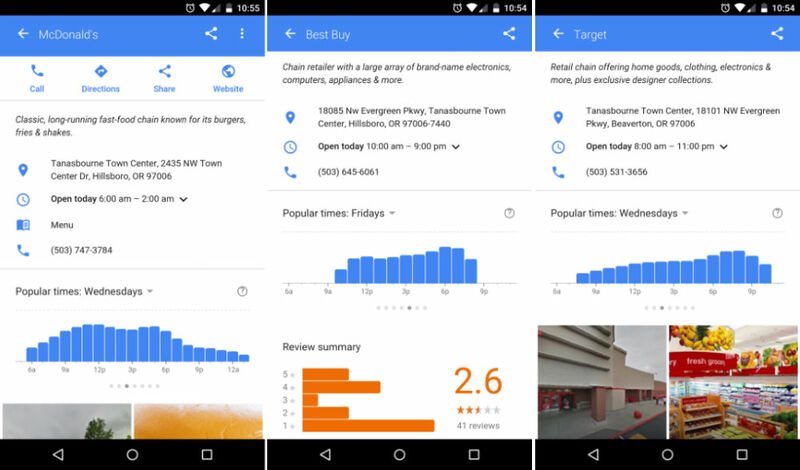 To see these times, when you go onto a store or business’s search result page, scroll down a little bit until you see the graphs. Once there, you can swipe left or right to see which day of the week you want. These changes have already rolled out to Google Search, so go check it out. Wednesday Poll: Would You Buy a Phone If It Lacked NFC?